Gujarat model: Chhattisgarh chief minister Raman Singh on the campaign trail. He says during the state assembly elections, the BJP will focus on his government’s performance and development work. You seem to be focusing more on development issues and the performance of your government in your campaign. But your party, the BJP, is taking up emotive issues such as inflation and terrorism at the national level. Don’t you think those issues are relevant in the state? We seek votes on the basis of the performance of the BJP government. For us, “gaon, garib, kisan" (villages, poor and farmers) of Chhattisgarh are as emotive an issue as terrorism and inflation. In our state, terror is related to Naxalism. We have been facing its ill effects for the past three-four decades. Thousands of people have lost their lives, hundreds of children have become orphans. Despite all that, we have been able to make an impact of good governance even in the remotest parts of the state. It is the failure of the (Congress-led) UPA (United Progressive Alliance) government to curb inflation and its non-serious approach towards combating terrorism that has affected our country very badly. Have you drawn inspiration from your counterpart in Gujarat? The BJP is proud that its government in Gujarat has been a trendsetter in implementing development schemes in the entire nation. Narendra Modiji has been successfully implementing the Gujarat model of development in an exemplary manner. The people of Gujarat have reinforced their faith in him. I draw inspiration from all successful models of good governance in the country. And surely from Gujarat as well, which is a role model. How bad is the Naxalite problem in Chhattisgarh? The Naxalite problem has been a major issue in the country, (and) not in Chhattisgarh alone. Several states such as Andhra Pradesh, Maharashtra, Gujarat, Madhya Pradesh, Bihar, Jharkhand, Orissa and West Bengal are also severely affected. (Prime Minister) Manmohan Singh has rightly identified it as a major threat to internal security. This issue will have to be tackled with the full cooperation of all the affected states under the leadership of the Centre. No single state will be able to solve the problem on its own. Chhattisgarh has taken several effective steps. No modern government will consider it only as a security-centric law and order problem. Our government has tried to look at the socio-economic and political issues related to the affected areas with sensitivity. We have put systems in place to push developmental programmes on the fast track in affected areas. We have also strengthened the law-enforcement mechanism. We have no hesitation in performing our constitutional obligations and giving basic support such as food and shelter to those affected villagers who have been driven out of their homes and thus deprived of their livelihood by the Naxalites. Our tribal people have realized that the Naxalites have done great harm to their society in the past two-three decades and have halted their progress. There has been a rise in violence. Naxalites are trying to terrorize the people against voting. But the police and the security forces have ensured that there will be adequate protection and people will come out and vote. Why did you change your constituency? Rajnandgaon is my constituency. I had represented this parliamentary constituency in 1999. I have contested from Kawardha assembly constituency as well as from the Dongargarh assembly constituency in the previous assembly elections. All these constituencies are part of my parliamentary constituency, Rajnandgaon. 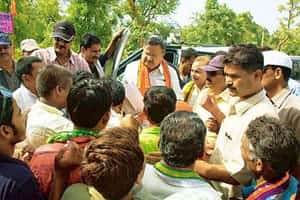 I would be happy to represent any part of my parliamentary constituency and, for that matter, any constituency in the state where my party wants me to contest. This time my party has decided to field me from Rajnandgaon. Why has the BJP changed many of its sitting legislators? There have been reports that this has been done to avoid the anti-incumbency wave and charges of corruption. The election committee of the party considered many factors. However, “winnability" of the candidates is the foremost consideration. After all, young blood and new faces will have to come into parliamentary politics and this is an opportunity for them. How bad is the anti-incumbency wave in your state? Where is the anti-incumbency wave? Leave alone the wave, there is not even anti-incumbency factor. I have been travelling the length and breadth of the state to monitor the implementation of the government programmes. During every summer in the past five years, I have conducted surprise visits to remote villages. In the months of May, June and July, I travelled more than 2,600km on road. It took me 19 days to cover 72 constituencies and I met more than two million people. The enthusiasm with which the people responded is really satisfying. I did not find any anti-incumbency during the entire tour. Indeed, people wanted more and more development and I could see their faith in BJP and in our government. What do you think about the mineral policy of the Union government? Chhattisgarh, along with other mineral-rich states, has expressed reservations against the draft mineral policy of the Centre. We, the chief ministers of Chhattisgarh, Jharkhand, Karnataka, Orissa and Rajasthan, have been repeatedly taking up issues related to the (draft) national mineral policy with the Prime Minister and also with (home minister) Shivraj Patil, who heads the group of ministers for finalizing the draft national mineral policy. We have jointly submitted a memorandum to the Prime Minister. I, in fact, met the Prime Minister a couple of times to discuss the issues that concern the state. We want that priority be given for the grant of mining licences to those who propose to put up mineral-based industries within the state. It is an irony that mineral-rich states such as Chhattisgarh continue to be among the most backward and poor states in the country. We want a national mineral policy which will address developmental concerns of the state. Do you think the global financial meltdown, the economic slowdown here and the job cuts that this has resulted in across sectors will play against the Congress-led Union government during the state polls? Of course, it will play against the Union government. The country expected more from the economist-Prime Minister. However, the UPA government failed to address the fallout of the economic slowdown. The Bahujan Samaj Party has fielded candidates in all the 90 seats in the state. Do you think the party will play spoiler for the Congress? Or will it affect you too? The BSP factor will affect the BJP too. The BSP is serious in the constituencies that will go to polls in the second phase of elections. The impact depends on how much they can divide the votes. Although they may not manage more than 6-7% votes, they will be a deciding factor at least in 20 constituencies, because the margin (of victory) may not be too large.